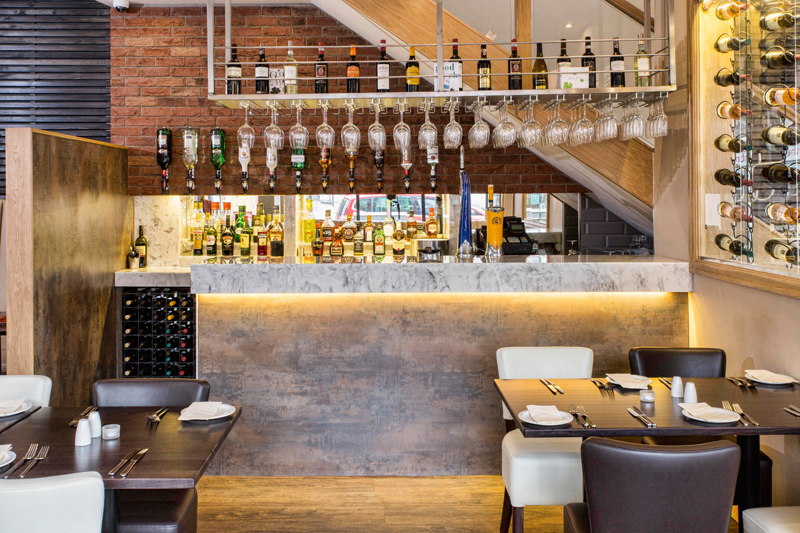 Amoro Restaurant in Blackpool has recently opened its’ doors with great success. We were delighted to work alongside and have our bar tops specified by Joseph Boniface Architects on this exciting new independent restaurant. Versital worked alongside architects Joseph Boniface in Blackpool who designed and specified the full project with a sleek modern sleek design. As an experienced architect in commercial projects they opted for materials that look fantastic, but that were also easy to keep and would last long after the opening. The client wanted a marble look for his Italian restaurant as a nod to tradition, but both he and the architect Joseph were concerned about using natural marble due to the problems the material inherently brings. 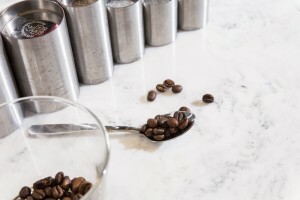 Being naturally porous marble has a tendency to stain and is not waterproof, which is not ideal in a bar or restaurant situation. Versital faux marble is the ideal substitute for real marble where a real world practical solution is needed, as well as looking the part. 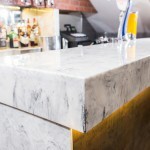 Versital bar tops have all the look of a natural marble being hand made, but are 100% waterproof and stain resistance – perfect for a busy restaurant and bar area. Versital finish ‘Arabesque’ was chosen here as a great alternative to Carrara marble. The white background and black vein have a beautiful depth of colour. Being a hand made and veined product, it is the nearest match to natural marble on the market using a synthetic stone resin. All Versital bar tops are manufactured to order to design specifications and sizes from either the client direct or the interior designer and architect. 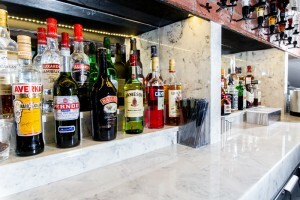 Bar tops can be made from plan where needed, or template if that suits a customer best. In this project for Amoro Restaurant, the client required a template taking by a fitter we were able to recommend and the bar top was manufactured to that precisely. 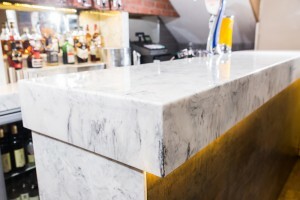 For more information on specifying or buying faux marble bar tops from Versital, or help with a current project please call us on 01204 380780 or send us a contact form with your relevant project information and company details.